Indonesia - October 2008 - Sumbawa conquered! It was the time of year for my annual kitesurfing getaway to Lakey Sumbawa. This year I decided to bring along my SUP. Or you can see all the images taken from all the 3 spot there. Thanks to my friend Peter Ho for the photos. 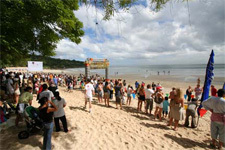 Great success at the Bali International Triathlon, with more then 350 participants from all over the world. The Winner was Mr. Luke McKenzie from Australia that finish in just over 2 hours giving with over 15 minutes to the 2nd qualified. Our SUP team was there and did a great job! We had to intervene to bring to safety 3 swimmer and to help few more to get to the end. There were a bit of a shore break and we spent time riding the small rolling waves and showing a bit of what SUPS is all about. We are inviting everybody to join Sunday 29 of June at the MRA Bali International Triathlon 2008. 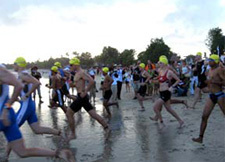 The course includes a 1.5 kilometer swim in the warm waters of Jimbaran Bay, a 40 kilometer bike ride on hilly paved roads and a 10 kilometer mostly flat run with a beach finish at the Four Seasons Resort Jimbaran Bay. The Bali SUP School will join the Kuta Life Guard team in guaranteeing the water safety during the swimming leg of the race. Starting time is at 7 am at the Four Season Resort. After the race you will be able to demo the latest designs in Stand Up Paddle Board by Starboard. If you have never tried before we will give you a short free starter lesson about how to do it… Hope to see you there. And here we are again, the waves season is started nicely. Good sized swell are pounding our shores! This is how Oka Point is been behaving for the last 5 days... I would say just magic!! This are the biggest waves I have been riding so far. My Bonga 10'0 is so sweet that I'm in love. Finally our shipment from Starboard is arrived. My first impressions of the boards are really good! The 11'2 is my favorite board as it very stable and floaty but still very maneuverable and loose in the wave. The 12'6 is also great for heavy people, the glide and the speed on this board are amazing and still surf very well given the big size. Manufacturing is state of the art! And the Carbon paddle is simply amazing! The best I have tried so far. We have all boards at disposal for free testing. Last 4 days we have been hitting Hyatt reef, a wave that frankly I thought was too much to handle for us. But I was wrong!!! See the images and judge by yourself. 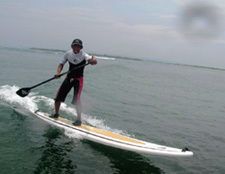 Also starring our local Hero Oka Sulaksana (Top Indonesian Windsurfer for the last 15 years) on his 2nd day on a SUP!!! He is already showing the difference between a real champion and us common mortal. Myself I was amaze considering that I'm not really a surfer!! I was catching the biggest waves ever without a kite or a sail. A very funny session in Sanur at Blue Reef. Waves were about 1 to 2 meter, absolutely no wind and enjoying with friends out there. I'm absolutely stocked by then fun we are having day after day!! Actually I think that I'm enjoying SUPS more then Kitesurfing. Is absolutely amazing that also many of the locals guys that when they saw an SUP board the first time were laughing at me are now having a ball, they prefer to use a SUP then a surfboard. Our school is fully operational… and we had our first client! Look at the picture on the right side! He is riding in style his first wave!! Check the School page for prices and programs. We usually go early morning to get advantage of no wind conditions. Our first shipment of SUP is arrived! Eight new Mistral Pacifico showed up at our front door…. We are so happy, finally I will not be alone SUPPING in the waves. Four boards will be used for our school and rental program. Four boards are going for sale!! 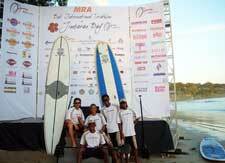 Do not wait too long if you want yours… See the local crew of Balinese boys posing Hawaiian style. Free SUP board bag for the first 2 lucky buyer!! 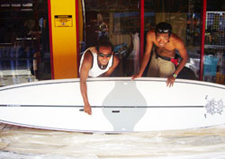 The price 1.200 US$ for the board and 210 US$ for the paddle.